← Flying Avare In Canada? 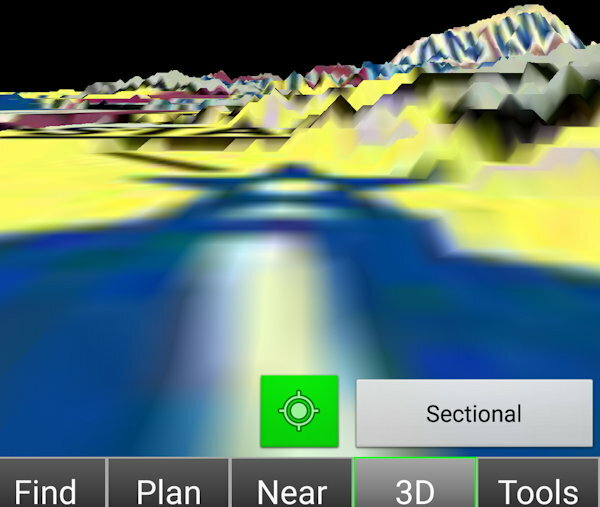 Avare version 7.2.3 has added a new “virtual reality” 3D view option! 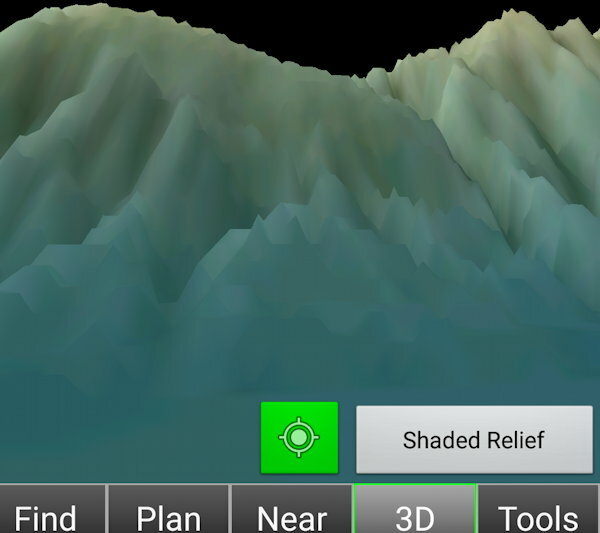 Now you can tap the new “3D” tab to view selected chart types (currently intended for Sectionals and IFR charts, with more to possibly be added). 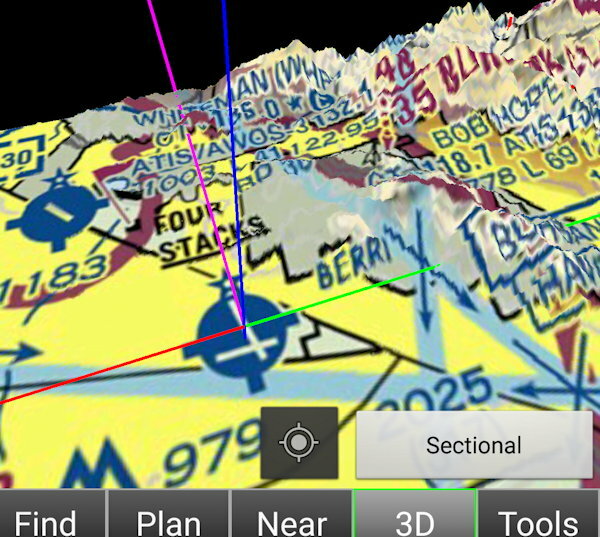 In the new 3D view, these charts show ADSB traffic, terrain, and obstructions in the vicinity. Note that the Center button turns green to indicate your view mode, and you can long-press it again for a return to Satellite view or tap the Map tab for that view. As you can see, this mode could be helpful for a quick glance (especially on a backup Avare device like a phone) in IMC or a night approach, and will be much more intuitive in motion than in these static screen capture samples. 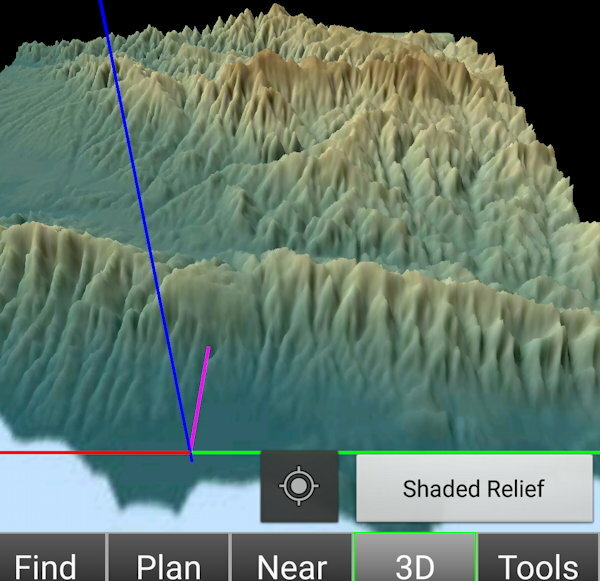 See the Help info built into Avare for details on how to use this new 3D feature, and watch for further refinements and additions in future version updates. Note: You will need to update your elevation file after launching this new version in Map view using Download->Terrain, and you’ll also want to ensure that you have the latest version of the charts you use. As with all aspects of Avare and the other Apps4Av products, we welcome your feedback and questions in the open and free Apps4Av Forum. This entry was posted in Avare. Bookmark the permalink.